What if you could do marketing that good, that even if you asked for money, people would pay to watch your ads or consume your content. How to do this without a big budget. Want the perfect marketing strategy for your small business? Want to make enough money from your blog quit your day job? Check out The Social Traffic Code! 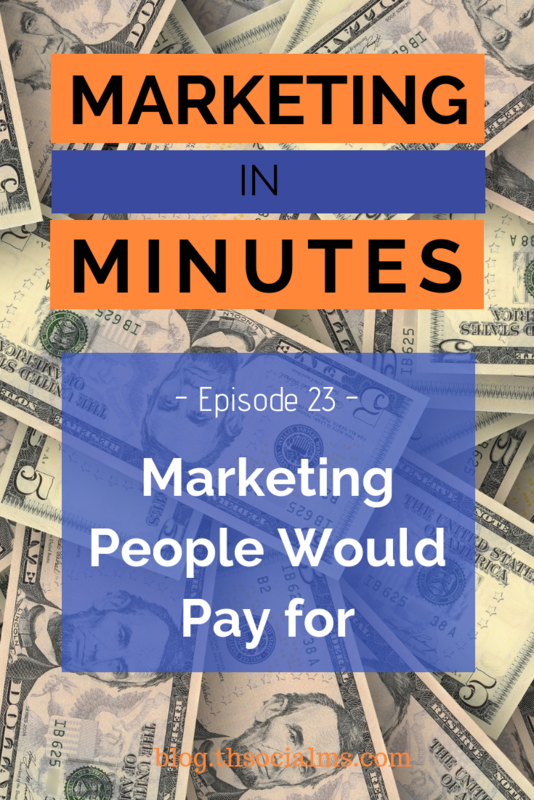 If you prefer reading, you can find the full transcript for this episode of Marketing in Minutes below. Online marketing is all about conversion rates – and good conversion rates can only be achieved when your marketing is done the right way. But how do you do that? How can you craft marketing messages that are so great, that a high percentage of the people who get in contact with them convert into customers? The answer is by doing marketing that is so great, that people would even pay for it. I’m Jonathan Gebauer and today, let’s talk about marketing that is so good, that people would pay for it. As always, if you like this show, please subscribe and leave a review on Apple podcasts or wherever you get your podcasts. When we talk about advertising and marketing, most people think about annoying banners on the web, annoying video clips shown on TV in the middle of your favorite TV show, annoying phone calls by direct marketers, and so on. Well, that’s not all there is. The worlds largest website for movie information and movie trailers is IMDB.com – The Internet Movie Database. And when you go there to watch the trailer for the latest movie you are waiting for, you will have to watch an ad before you see the actual trailer. If you think carefully about this, then the trailer is already an ad – it’s an ad for the movie. So in fact, you are watching an ad, to be allowed to see another ad. Ok, you are not paying for it, at least not with money. But you are willing to watch an annoying ad before you watch an ad you actually want to see. Let me give you another example of advertising many people actually want to see: Go Pro videos on Youtube. GoPro, yes, the sports and action camera company, has perfected Youtube Marketing: Whenever they release a new camera, they put out a series of adventure videos that has been mostly cut together from clips by GoPro users filming spectacular adventures with GoPro cameras. Sure, many of these clips are the results of cooperations between the athletes and GoPro – but the production time and cost is probably reduced by a lot – and still GoPro would probably even pay the full price – because their marketing videos are so great, that they always get millions of views – without paying a lot of money for distribution. I for one am someone who loves to watch these – because they give me the vibe of a life I would love to live myself. This is all great but as good as these marketing concepts are, if you would ask me to pay for a Youtube video of people going rock climbing, I would probably say: no thanks. If you want to up the game from marketing we love to see, the next step is marketing we would pay for. Do you think that is possible? It is, and it has already been done! One of the greatest examples of marketing that is so good, that people would pay for it, is the example of Hilton’s Twitter strategy. Not Paris Hilton – I’m talking about the Hotel company. They have an account called Hilton Suggests. And the only purpose of this account is to help travellers in cities that have a Hilton hotel. It’s not focused on Hilton clients. It’s not focused on employees or a specific niche. It’s just focused on people being in the city. If you need a taxi in a foreign country and are unsure how the system works where you are at this moment, tweet Hilton Suggests, and they will help you out. Looking for a vegan restaurant, they will help you out. Looking for the nearest pharmacy – they will help you out. Lost your passport? They will tell you what to do next. And they do all of this for free. If you’ve ever been stuck in a foreign city, you know that this would be worth money. But they don’t charge, they’re just there for you when you need them. What do they get from that? They achieve an extremely positive branding effect. They build a connection with frequent travelers. They become the brand that is there for them – and the next time they travel, a lot of them will check out the Hilton Hotel. Hilton Suggests is such a great example because it shows with how little effort you can do marketing that would be worth money. Compared to what they get in branding and ultimately sales, the cost of this Twitter account is marginal. But it may still be too high for your marketing right now. But that doesn’t mean you can’t do marketing that people would pay for. All you need to do is be a little creative. If your business is selling bike parts online, you could create a series of repair tutorials for bikes: How do I change the tyres, how do I repair the shifters, how do I swap the chain. As a local bike shop you could do the same thing, and then add a series of local bike routes for tours. And you could do a local search for your topics on Twitter and whenever a question comes up that you can help with, just send a Tweet. The same idea works in any area of business. It’s based around being helpful and becoming the goto person or brand that people ask for help. It’s often related to content marketing, but as the example of Hilton Suggests shows, it doesn’t always need content. You can even connect this with the idea of content curation – help people from your Twitter Account by sending them curated content. If you are unfamiliar with content curation – take a look at the show notes in which I will link to another episode of this podcast that talks about that. Doing marketing that is so valuable that people would pay for it is easier then you think. Be a little creative and provide people with the help they need and you can do it too! I hope you enjoyed this episode of Marketing in Minutes. If you like the show, please subscribe to the podcast and return for the next episode. And as I told you before, I would be really grateful if you could leave a review on Apple Podcasts. For more information on doing marketing that people would pay for, check out the show notes – you can find them at blog.thesocialms.com/mim-23… blog.thesocialms.com/mim-23. 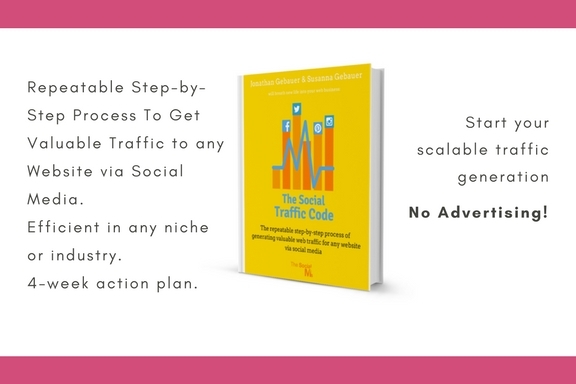 Or read our book, The Social Traffic Code – you can buy it via the link in the show notes.